The Skipper Welfare Association originally began as a specialized skipper store with affordable, daily fresh products. It also had a hair salon and laundry place for the captain and the crew. Basic comfort at ships was hard to find but as living conditions improved on board, The Skipper Welfare Association has grown into Belgian's leading training center for the Belgian inland navigation. It's also open for the wider transport sector, harbor related businesses and non-profit organizations. The Skipper Welfare has many different rooms available, all of them are provided with the latest audio-visual equipment. Let's take a look at all the different options. Do you want to organize a training or company party, while pampering your guests with culinary delights? You can! The Skipper Welfare has a fully equipped kitchen. Sandwiches and simple meals are provided by us. Want something more festive? In that case, we'll partner up with Culinaria. Please click here to start creating your perfect party. Anything at your size and wish! Are you organizing a multi-day training, a seminar or a conference? The Skipper Welfare maintains a strong relationship with International Seamen Antwerp . The hotel is situated only a few steps away from our location. Thanks to our good contacts, we can offer our customers an economical and reasonable formula. The "Groenendaellaan" stop is at opposite of the Antwerp Harbour Hotel (International Seamen), 2 mins walking distance. Bus 23/720/770: goes every 15 mins to the City Centre(Rooseveltplaats). Weekend times may variate. Make sure you provide a valid ticket. There's also an option to take the train at Central Station Antwerp. The Skipper Welfare is about 15 mins walking distance. Check the website to plan your route. From The Skipper's Welfare to the City Center,the Groenplaats or Central Station is approximately €12,00 to €15,00. From The Skipper's Welfare to the "MAS" (Museum Aan de Stroom)is approximately €11,00 to €12,00. And from The Skipper's Welfare to Sportpaleis and Lotto Arena, about €10,00. You can rent a bike at the reception of "Fietshaven" for €7,50/day. It's the ideal method to reach the City Centre and the Harbor of Antwerp. Also a nice way to do some sightseeing! There is plenty of free parking around The Skipper's Welfare, though reserving a parking spot is not possible. A large part of the city center has been made car-free. Almost everywhere you need to pay via parking meters. You can pay with coins or by SMS. Note the time, Antwerp has a strict parking policy. If you want to park your car in a "private" parking, the price will approximately be €15,00/24h. Halfweg 2018 zal de derde fase van de werken aan de Oosterweelverbinding starten ter hoogte van Straatsburgdok. In deze fase zal men de kanaaltunnels graven en aanleggen die de Scheldetunnel (fase 2) met de Antwerpse ring (fase 4) zal verbinden. 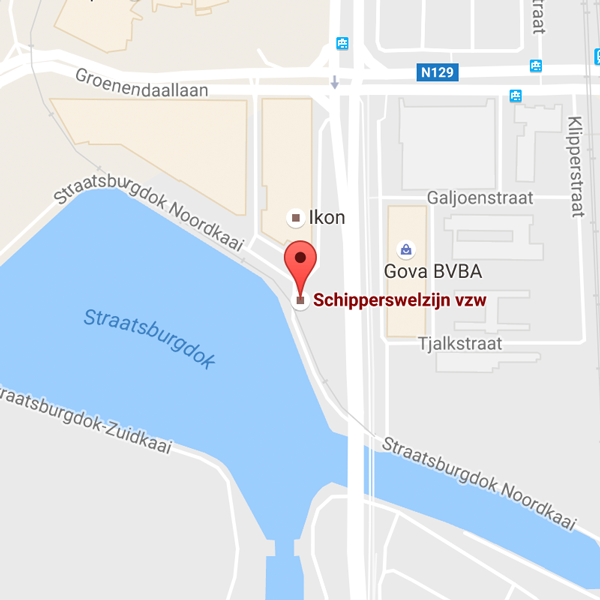 De logistieke aanvoer en afvoer van materiaal en bouwpuin zal via het water verlopen. De bereikbaarheid en parkeergelegenheid van het centrum voor cursisten blijft gegarandeerd .